WRAP, and other components of the Mental Health Recovery Program, are being widely used in Veteran’s Hospitals, by Veterans’ organizations, and by people in the military in the U.S.A. and around the world. If you are on active duty, in the reserves, or have ever been in the military, you may be having a hard time coping with the hardship, trauma, and loss related to military service. You may have feelings and experiences that are extremely upsetting; feelings that keep you from being the way you want to be and doing the things you want to do. In addition, things may be happening in your life that are difficult to deal with. Family members and friends who don’t understand what you have experienced or the way you are feeling, may not know how to respond or how to help. Some may try to help and others may turn away. You may feel like the situation is hopeless – that you will never feel well and enjoy life again. The Wellness Recovery Action Plan can help you in the process of recovery — getting well, staying well, and assisting you in becoming who you want to be. It will also be helpful for you in adapting to any challenges you have in your life, such as chronic illness, serious disability, being on active duty, or dealing with extreme loss or grief. View the Sample WRAP Plan developed by five members of the Vermont Vet to Vet Program. 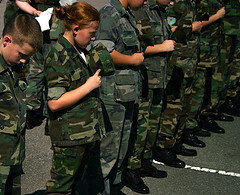 Mary Ellen is passionate about getting resources to those who are in the military or have been in the military. People are searching for ways to feel better and to develop/keep strong relationships with others. WRAP for Veterans and People in the Military, can help you work toward meeting life goals and dreams. It is a model that provides hope for recovery and a full life. WRAP, used extensively in support groups and in hospitals around the country, has become an important tool for veterans and people in the military. 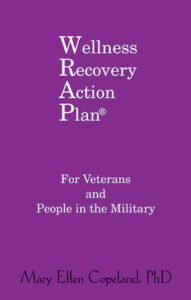 This important booklet was adapted from the well-known and widely used book, Wellness Recovery Action Plan. This version of the plan was developed with input and guidance from people who are currently serving in the military as well as veterans and people in veterans’ hospitals. While anyone can design and use their own WRAP, developing the plan with a supporter, in a group, or even as a family increases options and understanding. Each person will benefit from having their own copy. 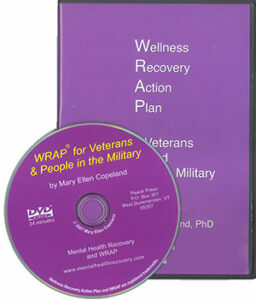 In this DVD, Mary Ellen Copeland guides the veteran or person in the military through each step of the process for developing their personal Wellness Recovery Action Plan. It can be used on its own or to compliment the WRAP booklet described above. Individuals will benefit from having their own copies, or the DVD can be used again and again as a resource for groups. It can be a useful tool for families as well. If you are on active duty, in the reserves, or have been in the military, you may be having a hard time with feelings and behaviors that are hard to deal with and address. They may be upsetting to you and your family. You may feel like they are taking away the life you had envisioned for yourself, and getting in the way of the dreams that sustained you while you were away. The Wellness Recovery Action Plan is a simple, self-directed process that helps you figure out what you need to do, and how and when to do it, so that you can move forward with your life, doing the things you want to do and being the kind of person you want to be. This online version of the Wellness Recovery Action Plan (WRAP) is specifically oriented for people who are in the military or have been in the military. There are video clips with Mary Ellen Copeland talking to veterans as they are developing their WRAPs. This WRAP is private and can be accessed at any time. You can make changes to it whenever you want and e-mail it to anyone you choose. WRAP can help with coordinating daily living as well as larger issued like depression and PTSD. This version of WRAP is very convenient for military personnel and is friendly, easy, and empowering. President, Resilience Advocacy & Associates, Inc.
At the 2nd International WRAP Around the World Conference in Oakland, California, Mary Ellen Copeland, Veteran Leaders and VA staff, Copeland Center For Wellness and Recovery, and Vet To Vet leaders met to discuss furthering WRAP FOR VETERANS AND PEOPLE IN THE MILITARY in the VA’s offerings of recovery opportunities to Veterans. Vet to Vet Chapter Founders, Lorain County and Stark County, Ohio. Vet Ohio, with Ken Prabucki. Ken is the Peer Support Coordinator for the Cleveland VAMC and the liason for the VA to Vet To Vet Ohio. Walter and Ken are standing in front of the VA Center for Stress Recovery in Cleveland, Ohio, where focus groups of Veterans of both genders and all eras met to go over WRAP to create a Veteran- Friendly Version of WRAP that Mary Ellen Copeland published as WRAP for Veterans and People In The Military. The map shows the Louis Stokes VA Medical System (Northeast Ohio), which is the target area for our pilot project to train 100 Vet To Vet Ohio Facilitators who will be cross trained as WRAP® Facilitators and NAMI Facilitators. The Ohio wide goal is to train 600 Vet To Vet Ohio Facilitators over three years to work as 300 co-facilitator teams. Gene Hi cks is a retired (21½ years) Infantry First Sergeant (E-8) who has served in Iraq and Afghanistan. Gene is currently attending a program that will certify him to conduct the Wellness Recovery Action Plan for the veterans he serves. 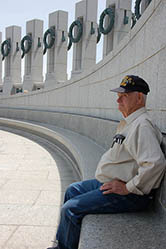 After his retirement in April 2011, he saw first hand the hardships that are associated with leaving the Military. Gene is now committed to help elevate and serve those who served, as a counselor and a service coordinator in Boise, Idaho. This article has lots of resources for veterans that need help now. 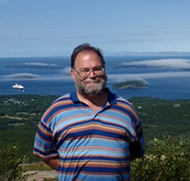 Click here to view a sample WRAP Plan put together by a group of Vietnam Veterans who gathered in White River Junction, Vermont in February of 2008.